I was hoping there would be a picture of the playing fields of Patcham County Secondary School. I started school at Carden Primary in 1955 and moved on to Dorothy Stringer. I attended this school from 1952 onward. I remember Mr Budleigh as the headmaster. Mrs Shipham was an elderly teacher. I’ve now lived in Canada since 1974. My mum used to pick me up from Patcham School on Ladie’s Mile Road and take me to Carden School for speech therapy every Monday afternoon. The picture shown is of Carden School, but two of the previous comments are about Patcham. I went to both. Due to the sheer number of kids being rehoused in Hollingbury, many of us had the old Patcham methodist church as our school whilst Carden was being built by Italian prisoners of war, who I believe came from Lewes Prison. I was also in their first intake when the doors opened in 1947. I attended this school from about 1959. I remember that Mr Emmons was the head. I liked Mr Kitchen he was a very encouraging teacher but Mrs James was a right dragon. One afternoon I played truant with two other girls and when Mr. Emmons told us off he said that if we’d been boys he would have given us the slipper. Yes, I remember all of those! How about Mrs Marsh… didn’t like her! I attended Carden School from 1949 – 1957. We were always told that the school had been designed as a hospital, hence the doors that opened onto a patio outside each classroom. Can anyone confirm this? I believe it was the first school completed after the war and certainly had the newest equipment which encouraged many visitors to the school. The Headmistress in the infants’ school was Miss d’Etlinger and the Headmaster of the junior school was Mr. Ede, a kindly, elderly man (in my young eyes), who I believe worked at Patcham school before being the first headmaster of Carden. He retired at easter 1957 and Mr. Emmans, headmaster of the Downs school, took over as headmaster. I have very happy memories of Carden school, the bright airy classrooms and the wonderful playing fields where you could find adder skins for the nature table. Nature walks were to Stanmer woods or the area where the factories now stand, where we searched for rare flowers. I especially enjoyed being in Mr. Cheesman’s class for two years before leaving to go to secondary school. He was a very enthusiastic teacher and especially keen on poetry and English. I still have copies of poems I wrote whilst in his class. I’m sure coping with a class of 48 pupils must have been difficult but he inspired us all to work hard. Mr. Monger was the deputy head and we were all rather scared of him. He played classical music in assembley and did his best to educate us in the arts. Who remembers the picture by Bruegel of ‘The Wedding Feast’ which hung in the same position throughout the years I attended the school? Mr. Kitchen and Miss Aldous took us for swimming at St. Luke’s baths one evening a week, two bus rides and a long walk up and down Islingword Road. I returned to the school when it celebrated its 50th anniversay and was surprised to see the original small wash basins in the corridor alcoves and the original book cupboards in each room. Mrs Marsh gets my vote as the ‘teacher from hell’ too! This is my old school. I am now writing at Patcham about it. I went to Carden Infants and Junior schools. I have fond memories of playing soccer on the five-a-side pitch on the top playing field. I played football for the E&A team. I’m 29 now so that was in the late 1980s. I attended Carden School from 1976-1983. The school has stayed with me all these years and has formed part of the description in my book ‘Mathamagical’. I still meet up with people I met there. Even after all these years we talk about the school with such enthusiasm. Our headmaster was Mr Nunn, he was another who would play classical music to us in assembly. Mr Cartlidge was an isperation to me and I would love to meet him again. I would have loved to have attended the 50th anniversary but I live in Blackpool now and didn’t get to here about it in time. The book being writen by Ciara would be wonderful to read, or even be involved with. We had a ghost story, Wendy Pain who used to haunt the girls’ toilets. Oh wonderful days. Interesting to read Jacqueline Pollard’s memories of the school. It brought back quite a few memories to me. One of the things being that the deputy head’s name was spelt Mongor and he was always picking up anyone who didn’t emphasise the last part as ‘or’ (not ‘er’). I think that I must be a year or two older than you as I left the year the the King died in 1952. I remember the solemn way we were told of his death by Mr Ede. I last saw Mr Mongor in the 80s at a Dinner Dance at which my band was playing, I believe that he was well into his nineties. Other teachers in addition to the ones you mention were Miss Shoesmith and Mr Wright (who was handy with the Strap). I also seem to remember a Miss Steel who, before teaching at Carden, was at my infant school, St. Marks. I lived in Crabtree Avenue and attended this school when it first opened. I remember Mr Ede as headmaster and a lovely Canadian teacher named Miss Radcliffe. Soon after, my parents and I migrated to Melbourne, Australia; I have lived here since. Whatever happened to Mr Emmons and Mr Kitchen? l always remember the smell of his office – coffee and sure tobacco! I also remember the swimming pool outside Mr Kitchen’s class made out of blue plastic. I attendend the infants and junior school. Mrs Cage, the reading teacher, she was scary. I went to Carden Infants and Carden Juniors until 1960 and then on to Dorothy Stringer Secondary Modern. My favourite teacher was Mr. Goodchild who inspired me to read by reading Famous Five books to us at every spare moment or on wet sports days. I met my first girlfriend Lynne Harvey in the final Carden year and subsequently Dorothy Stringer. We lost contact after school days finished and never saw or heard from each other again until 2001 through Friends Reunited. We are now living together in Somerset and are blissfully happy sharing our memories of Brighton. My Brother Michael and sisters Anne and Marcia also went to Carden. Mike and Anne went onto Patcham whilst I and Marcia went to Stringer. My eldest Daughter Marianne also attended Carden and Stringer. We all were raised at 67 Crabtree Avenue. I also remember Mrs Marsh as I was in her class 1 3. Does anyone remember a Miss M.C.Kimon – not quite sure if this is how the name is spelt. My friends were Lesley Hardy, Sandra Farr and Pat Marshell Lesley. I went to DSS in 1963. I was always being hit with a glass ruler for talking in class. I lived in Fernhurst Crescent. Yes, I remember Mr Ede for his smile, Mr Mongor for trying to get everyone to sing in Welsh, Mr Wright for saying he was never “wrong,” Mr Cheesman for sport and Miss Shoesmith for her Marilyn Monroe wiggle as she led our class down the corridor and Miss Still (or was it Steel?) for marching into the boys loos and dragging you out by your ear even if you were mid-you know what. I also remember digging holes in the embankment to make garages for the Dinkey cars that you ran along the low wall and collecting cigarette cards, swapping them to make sets and winning them from others in a game that was called “Tabs.” Other memories include playing fivestones and dashing across the yellow line down the middle of the playground (which divided the boys from the girls) and upsetting the girls’ collections of beads that they were swapping from old tobacco tins. I attended Carden School from 1976-1983, and last year (2006) I launched a website dedicated to the class year 1982/83, and since then have helped to arrange several school reunions. The website is updated regularly with news and photographs. See http://www.carden1983.info for more information. Boy, does this page ever bring back memories! I lived at 41 Crabtree Avenue and went to Carden School from roughly 1954 to 1958. I remember Mr Cheeseman – he gave me my love of maths and his wife taught me at my previous school (so long ago but I think it was Downs Infant School?). Mr Cheeseman was indeed an inspirational teacher. I must have been one of those girls with a collection of beads in an old tobacco tin – they were my pride and joy. I have lots of lovely memories from Carden. I loved this school and was very sad when we all left in 1983. I lived at 117 Denton Drive. I have very fond memories of Mr Trott, i used to think he was great and looked forward to his lessons. Thanks to Mark Rogers though have met up with lots of old faces at the reunions and hope to go to lots more. I went to Carden from 1976 to 1983 and have very fond memories of the school. Mr Nunn was the Headmaster and I always remember sitting in the Hall on that hard floor in assembly listening to classical music chosen by him for that week. I went back there for a tour very recently with some old school friends and can’t believe that they still have the same hand basins in the corridors and paintings on the walls. Mr Cartlidge was my favourite teacher, he had great enthusiasm and really encouraged all of us to do well. I especially used to enjoy the times he used to get his guitar out in class and sing songs such as “If I had a Hammer”! Do they make teachers like that anymore? Probably not! I left Carden in 1960 but can’t remember when I started in the infants. It must have been around 1955. I recall an elderly teacher who when she blew the whistle in the playground her false teeth dropped. Vague memories of Janet and John but I can always picture those false teeth. I have found memories of Miss James who went to live in the US (Texas, I believe) Miss Still or was it Steel, and of course Mr Mongor, and Mr Cheeseman, my last form teacher. I have a photo of Mr Cheeseman, myself and the friends including Graham Hurford, on the day we left Carden. Brighton in the 50s and 60s was a great place to grow up, and particularly the freedom to roam over Hollingbury golf course, the giants foot and Stanmer Park. I went on to Dorothy Stringer and then Brighton Technical College before heading north for University and then settling in the West Midlands. I lived at 17 Carden Hill. The Carden1983 website has recently changed the domain to dot com and is still regularly updated. Visit it at http://www.carden1983.com. I grew up in Hollingbury from the age of three so Carden was my school from 1951. I also fondly remember Mr Kitchen. He was my teacher in my last year there, and it was for the first time I felt I was addressed personally and cared for, if I didn’t understand something he had been teaching. He made it clear we could approach him when not clear. This gave me the courage to admit I lost the plot and he would call me to his desk where he would go over again the sums and give me time to think better. Hence that was the first time I got anywhere with maths. I also remember Mr. Eade, he was a very nice man. Later having departed to Dorothy Stringer I found myself back at Carden when in around ’60-61 a pop night was created for us jivers in the canteen area of the school every Friday evening. There was only Coca-cola drink but lots of great records to dance the evening away to. Anyone remember it? The dance club first started in the downstairs Sunday school area of the little church on Lyminster Avenue, and then it moved to Carden where we had much more space to jive. 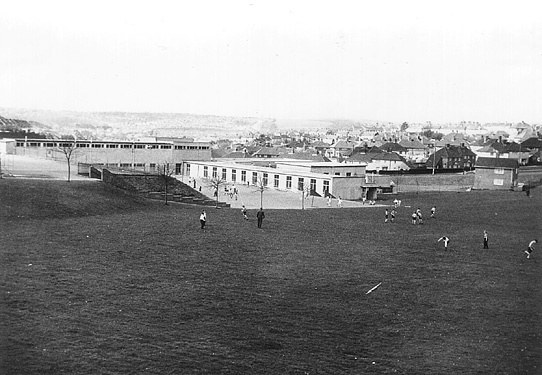 I used to play football on the Carden School playing fields in the 50s. The thread refers to Patcham County Secondary School. I attended this school from 1949 to 1953. The headmaster was Mr Budleigh. Miss West was the music teacher. I fondly remember girl friends Sally B, Caroline S and Pauline W …. and Angela. Best regards. Wow what pages of memories. I was at Carden School from 1955-1961. My four brothers and one sister all attended the school before me as I was the youngest. I lived at 63 Crabtree Avenue. Now semi-retired in the Welsh valleys enjoying my grandchildren. I remember Bingo in Carden School on Friday nights in the 1950s. I think it raised money for the Scouts. In the 60s I taught in the Sunday School in Lyminster Avenue that Sandra mentioned. I started in the infants in 1964, the head teacher was Miss Bell. She used to play a gramaphone recording of Greensleeves as we walked into assembly. Our form teacher was Miss Newman, who taught us to read using the flash card system. I still get a thrill if a see a single word printed on an oblong of white card. I don’t remember the teacher for my next year but I was taught by Mrs West the year before going up to the juniors. I remember the mysterious store rooms under the class rooms on the corridor where Mr Crossman the caretaker kept all the old desks and chairs. I remember being taken outside to see an eclipse of the sun and we all had to bring an old photographic negative in to view it through. And yes, I remember that blue plastic ‘swimming pool’ and being taken up to Patcham Fawcett to swim in their real one! I left for Varndean Girls in 1971. I am in year 5 at Carden now and nearly in year 6. I am sad to say that we no longer have Mrs Corbet but have a wonderful new head teacher called Miss Scott. When I started in reception, I enjoyed it so much and I still do now. In reception I had Miss Valdus. In year 1 I had Mr Hammond (my favourite teacher) and in year 2 I had him again! In year 3 I had Mr Weldon. In year 4 I had a new teacher called Miss Day and now in year 5 I have Miss Selwood. Next year I am hoping for Mr Hammond or Mr Weldon. I will defenitly will Miss Carden a lot when I leave! Hi Anne, Re your comments 20/4/09. I’d be very interested to know if you have a sister called Elizabeth? I hope you don’t mind my enquiry. I too went to Carden School when it first opened in 1947 and remember Mr Ede, and my favourite Mr. Wright, and Mrs Aldous (who never did teach me to sew anything other than a dirndl skirt!). Hollingbury was a lovely new housing estate and quite safe to play or walk to the Giant’s Foot or Stanmer Woods. Does anybody remember the Youth Club held at the school in 1954? Where we jived to Elvis Presley’s “I want to be your Teddy Bear”? and I had a crush on a lad called Bobby Bray from Denton Drive! Dear Mark Rogers, my Number # 1 cousin. Would you please open the Carden site back up please? Sincerely, Cousin Eddie, Oshawa, Ontario, Canada. Thanks Mark. I went to Carden School for just a few weeks, we lived in the last house in Denton Drive (had a huge corner garden). All I remember about it was afternoon naps and then ‘welfare’ orange juice. We then moved to Dale Avenue and I was transfered to Patcham Infants. The only times I returned to Carden School was to visit the dreadful school dentist there. I was at Carden from 1959 to 1965. I was wondering if anyone remembers the uniform. I’m sure I can recall a green blazer with a badge showing the County Oak. Put me out of my misery someone! I was at Carden from about 1958 until my family emmigrated to Australia in 1964. I think I had Mrs Marsh as class teacher in year three. She was very strict, and I remember a boy being sent to our classroom for her to cane. I have very fond memories of this school, and can faintly remember there was a uniform, but as far as I can remember it was compulsory. It was a green blazer with the country oak badge on the pocket. Thanks Ann for confirming my memory of the green blazer and badge. You must have been a year above me. I remember Mrs Sadler in the Infants School and Mr Cheeseman and Miss Funnell in the Juniors. How about the Janet and John reading scheme – and keeping tadpoles and newts in a tank at the back of the classroom on the Nature Table. The nearby shops yielded many treasures too; stale cakes and broken biscuits from the bakers and rabbits feet from the butchers – there was a craze for these for a while and we used to carry them around as a good luck charm! Hi Ann Pederson, did you have a sister called Margaret and live in Carden Hill? Would love to contact Margaret again. I started at Carden Hill Infants in the early 1950s and then to Carden Hill Juniors in the mid to late 50s, and from 1964 to Dorothy Stringer. I remember being in the infants in the early ’50s and I remember in the afternoons we all used to have a sleep in the green cots; does anybody remember that? I am currently at Carden Primary and am in year six. My teacher is Ms Stavley and she is a very nice teacher like all the rest of the teachers. When I leave to go to Patcham High, I will miss Carden a lot as I have been there for eight years. I really don’t want to leave Carden. I went to Carden Infants & Juniors before going to Patcham Fawcett in August 1980, lived at Birchgrove Crescent, Carden Hill and Midhurst Rise (across from Carden Parade shops). A lot of my family also went to the school – Nicola Weller, Daren and Adrian Cross as well as my lil bruvs Stuart & Ian. Great memories. Remember playing in the sandpit before starting full time school. Remember Mr Nunn and my 4th year form tutor Mr Fulleylove, my other teachers from Carden Juniors were Miss Waghorn, Mrs Firmer and Mrs Allen (or as we called her Old Granny Allen) – also remember Mr Kitchener retiring and doing a speech in the assembley hall. Facebook has helped me track down a couple of school mates recently. I went to Carden and left in 1978. I was reading down the page trying to remember the names of other teachers – Mr Kitchener, Mr Tatum and Mr Nunn I could recall, then I read Steve’s post and yes Mr Fulleylove, Miss Waghorn and Mrs Allen I remember well, also Mr Crockett or some thing like that. We lived in Fernhurst Crescent and my mum is still there. Oh the memories. I attended Carden School from about 1959/60 and have many memories of the teachers including Mrs Allen, Mrs Marsh, Mr Cheeseman and Mr Emmons who I was a little scared of to say the least. I remember play times in the playground, and playing marbles and conkers but playing football was my first love. My circle of friends I remember were Nicholas Butler, John Glass, Kevin Ruffel, John Nix and Graham Mitchel. I still have a photo of them sitting on the steps (that are still there now) leading up to the top field. Happy days. I was a pupil of Carden School in the first year it was opened. I believe that was 1948. It was, I believe the first new school built by the Labour Government after the war. Mr Chuter Ede was, I believe, the Minister of Education and opened the school. I was only there a year before moving on to Varndean Boys’ School. I have lived in Portland, Oregon, USA, since 1964. Hi all, wow what a sight. I was at Carden from I think about 1957. Mrs Marsh- what a cow! She would poke me in the chest with the pointed end of a bic pen and leave marks on me. I was so frightened of her. I got her for three of my four years in junior school. Miss Funnell was my other teacher- she had a beard. Not happy days for me. I lived in Rotherfield Cres no 6, with my four sisters and one brother. My nam’e was Dorathea Smickler then. I dont know if anyone remembers me? I was at Carden from 1948-1953. Several years ago I provided this site with a piece about my first school at the Long Barn, Patcham and the Carden class photo with Miss Shoesmith and Mr Ede ended up there. If you want to see it, click here. I can still put a name to every one on it, but it’s not that I have a good memory, even then I had the sense to write their names on the back. I attended both infants and juniors at Carden between 1953-1960 and have fond memories. I remember Mr Cheesman as a great teacher especially on the football field. Was Mrs Marsh previously Miss Hambleton ? If so I remember having a crush on her. I lived in Elstead Crescent at the time and Hollingbury was a great place to grow up. Hallo Dotty, I remember you but you probably won’t remember me. I went to Dorothy Stringer School with your sister Susan. We were not in the same class but we were buddies for about a year. I used to walk up the road from my house, 59 Rotherfield Crescent, to your house, 60 Rotherfield, (which has been miss printed here as number 6), to meet Susan to go to scool. She and I would have been about 14 at the time. I remember Susan helped me get my first Saturday job in Black’s clothing shop in Western Road just close to Debenhams. Susan worked in one of their shops, also in Western Road, and managed to get me an interview at the other one. It wasn’t really legal to take Saturday work before you were 15 but they didn’t ask my age so I didn’t tell. Collecting Susan for school often meant knocking the door loud enough to wake her up but then while she busied around getting ready I prepared toast and Marmite for the two of us. A favourite with us both. I remember your Mother and Annette and vaguely your brother. Plus a young todler, Helena, whom I have recently made contact with through this site. Thursday evenings I would come up to your house to listen to Luxemburg Radio top ten hits. Then we would jive around your lounge uniterupted for half an hour. Don’t know where the rest of you all were. Steering clear I imagine!!! I hope Susan is well and if you have contact soon please send her my best regards. Many thanks, Sandra. Like Ian McKechnie, I attended Carden School when it first opened in 1948. I well remember the ‘new’ smell throughout and strangely, the yellow tiles in all the corridors. My teacher was Mr Winters, a kindly, elderly man (for a teacher.) A strange coincidence, Ian- I also went to Varndean and also ended up in Portland, Oregon, USA. I now live in Newberg, 25 miles down the road. I would like to contact you but you are not in the phone book. My E-Mail address is with the website & my tel.# is 503-538-4344. I went to Carden School from 1965 and lived straight across the road in 12, County Oak Avenue. I loved the school and I still love that house. I can remember it like it was yesterday. I left England with family and came to Australia in 1974. I would love to be able to contact Marion Ogle who lived in Denton Drive. I am in contact with lots of people but have not been in contact with Marion. I love Brighton so much even though I haven’t been there for over 30 years. You can take the girl out of Brighton but you can’t take Brighton out of the girl. I went to Carden School from about 1975-198., I remember doing cross country running around those massive playing fields. I lived in Birchgrove Crescent. I can’t remember many of my teachers, but I know I was in Mr Fulleylove’s class in the 4th year. I also remember doing the school plays. I was the narrater for Alice in wonderland and in the choir for Charlie & the Chocolate factory. Would love to see any photos of the school at this time. I went to both Carden infants and juniors and had Miss James as my first teacher. Miss James married a Canadian I think whose name was something like Zacharychuk.I still have the letter Miss James sent me from 7 Sennybridge Rd, Camp Shilo, Manitoba and a post card of the Queen Mary on which she sailed to the USA. I managed to contact her in the 70s by writing to the above address and by some miricle got a lovely letter from her in reply also asking about Lyn Cash. Her original letter is dated April 29th, 6pm, 1955 NewYork. I went to Carden from 1963-1970 remembering “Eggy” Emmens headmaster and Miss Tregenzer! Great mates where Den Woolmer, Dane Thacker, Pete Haines, Tony Vaughan, Steve Parsons, Paul Laurie, Freddie Allum, Caroline Pentecost, Janet Stone, Debbie White and Sandra Elms. Can we go back to the great times of our lives? To Jennie B. Your message of 2.5.2010 first seen today 29.7.2010. Yes we lived in Carden Hill and one of my sisters is Margaret. If you would like to correspond with Margaret please give me an email address so she can write. Hated the school and most of the other kids that went there. Was badly bullied and the teachers did not know what dyslexia was They just put you down as being thick. I was speaking to a friend and she told me that Janet is still at Carden school; she has lived in Hollingbury most, if not all, of her life. I bet she could tell a tale or two about Hollingbury and Carden school. Well done Janet for all years you have put in to help teach our children. You have seen eight of my family through the school! My wife taught at Carden for 18 years and still has ‘old’ pupils coming up to her in B’ton to say hello – even though she left in 1985 after many happy years there. Incidentally whatever they say we shall always call it ‘The Palace’ Pier! Both my sons went to Carden as did/do my grandchildren. Mr Peter Cartlidge was a great teacher but sadly recently died. I started at this school in 1969/70 in the infants, I then went to the juniors in 1972/73 and then to Patcham Fawcett hHgh school for boys in 1977 – 1981… I have tried locating pictures of Patcham Fawcett but don’t seem to find any on the internet. Never mind they were really good times – well except for the cane, slipper, belt, blackboard rubber and the massive dictionary around the back of the head! Kids are treated like royalities these days! (I now sound like my parents). Have fun everyone and hello to all you that remembers little Raymond Allen. Hi , I used to live at 13 Fernhurst Crescent with my mum and dad, Harry and Grace and my brother Barry and my two sisters Valery and Barbara. I was born in 1951 and I have really happy memories of of Hollingbury in the 50s and 60s. We lived opposite Mr and Mrs Clark and their children. My best friend who lived in Carden Hill was Kenneth Baverstock- his dad was a policeman and they lived in a police house with his mum and brother Charlie and Jennifer. If he sees this I would love to meet up again. 1976 to 1983 – best teachers were Trott and Cartledge. Can’t remember which house I was in Arundel, Lewes, Pevensey. Used to mime for the hymns. Was a tree in the Christmas play once. Apologies if this has been posted before, I’ve just come across a short newsreel about Carden made in 1949 when the school was still quite new. It can be viewed at http://www.britishpathe.com/ and type in “prefab school Brighton” in the search box. The film starts by showing exterior views and then there are images of a classroom, the stairs between the Infants and Juniors, the wash basins, the canteen, the little truckle beds. Although I didn’t start at Carden until 1959, ten years after the film was made, it brought back so many memories. It’ll be interesting to see if anyone recognises any of the children, or the teacher on the staircase, or the teacher being presented with the posy. I started Carden School in 1971 and lived in Chelwood Close. I was at the Jubilee party in 77. If anyone remembers me or has any pictures please contact or send through my email address carolynmechen@msn.com. 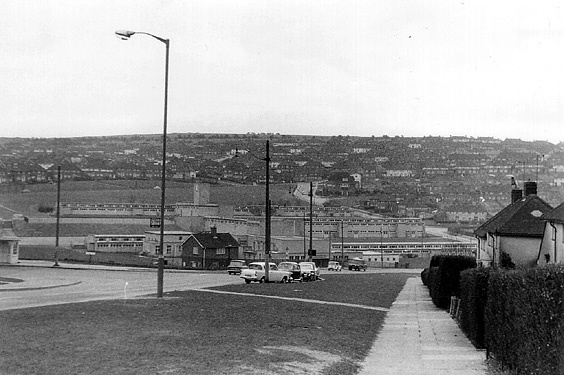 I was at Carden Hill in1953 and I remember the little green cots we had an afternoon nap on. I don’t really remember much else, I think I was only there for a short time. I’m not sure if that is me in the photo or not, I didn’t think I wore glasses when I was younger, but maybe. I went to Carden from 1979 through to1985. Reading these posts take me back. I live and work in Switzerland now and often wonder what happened to everyone (pupils and teachers). I’ve just stumbled on this page and sad to hear some of the great teachers have passed away. I remember Mrs Waghorn, Mr Nunn, Mr Trott, Mrs Fermer, Mrs Morgan. I recall Mr Fullylove died in 1983:I remember the assembly when Mr Nunn told the us. I recall also Mr Nunn left and we had a Head Mistress (cannot recall her name). Had a wonderful childhood there… How things change! If anyone sets up a web site on the school, let us all know. Hi Stephen Raynsford, l went to Carden from 1949 until we left for Patcham seniors in 1953 and two of my friends from Hollingbury youth club lived next door to you at no15 and no 17 Fernhurst Crescent. I’m not sure which one Pam or Helen. l remember having to eat a very hard toasted rusk after school dinners and then we had a sleep on the little green beds. Hi, Stephen Raynsford here. A message for Carol Wickham. I do remember your name. What number did you live at Fernhurst Crescent? I lived at no. 13 on the corner next to Mrs Brown. The other side was Mrs Gee and opposite us were Mr & Mrs Clark and their family: there was Ron, Wally, Rachel (or Ra Ra), Brenda, Johnny and Sid. I would love to hear from you or anybody who knew me and my family. Hi Stephen, my friend lived next door to you. l thought funny thing they both had the same surname “Baker”. Do you remember them. David Whitchurch, are you the David Whitchurch who lived opposite us in Westfield Crescent? We were at 77 and you, if I recall correctly, were at 100. I have just discovered this website and was very interested to see a comment from Bryan Baldock as I lived opposite him at 66 Crabtree Avenue and knew all his family very well. My name is Jill Rowley, maiden name Rice. I have a brother called Peter and my parents names were Edna and Fred. I never went to Carden School as I attended the Downs School before I moved to Crabtree Avenue. I now live in Bognor Regis. Nicky Durrant, are you any relation to Michael Durrant who went to Carden in the 60s? My family moved to a new house in Fernhurst Crescent in 1951. I sat my 11+ exam at Carden almost as soon as I got there; a different way of teaching from Finsbury Road school, I was a bit lost to say the least . Just found this site. I lived in Midhurst Rise and went to Carden from ’59 to ’65. I had a great time and I remember being in a Xmas play. Who remembers the winter of 1963? I went to Carden School from 1967 to 1971. I used to live in Petworth Road. I recently needed a plumber and it turned out to be Richard Marchant who was at Carden at the same time. We have been reminiscing and recalling lots of memories. Would love to hear from anyone else who was there at that time. I went to Carden School from 1955 to 1960, does anybody remember me? My family lived at 50 Fernhurst Crescent from 1950-1961. My parents were George and Barbara Nailard, my brother Michael. We both went to Carden School in 1955 to 1961 – very happy memories of growing up in Fernhurst Crescent in the 50s. I lived in Carden Hill and went to Carden School from about 1966 to 1972 before going to Patcham Fawcett. My dad, Eric Crossman, was the caretaker at Carden from just after the war until he retired in 1985 and will be remembered by many who had commented on this page. When I was 5 or 6, we had to move from Midhurst Rise into the new school house so those school grounds really were my extended gardens and I spent a great deal of time wandering the grounds and playing on the climbing frames but it could also be quite lonely (for security reasons, dad wasn’t keen to encourage too many friends to visit my brother and I). I left when I married in 1973 and left Brighton in 1978. I recently made a point of driving by the school after many years and was shocked to see the high fences which made it look like a prison. At least the old school house has some lovely trees to add some privacy and it looks like it now has double glazing because that house was VERY cold in winter! I was at Carden from 1960 to 1967, and I remember Mr Crossman. He was tall and slim as I recall. I’m amazed at the length of time he was there – nearly 40 years! That’s dedication. I too remember Mr Crossman. A very kind and gentle person. My years at Carden were from the summer of 1951 aged five, to summer of ’56. I was at Carden from 1966 To 1972 before going to Patcham Fawcett. At Carden were Karen Vane, David Jenkins, Janet Hemsley, and Richard Whittington. Here’s my pennysworth. I attented Carden from 1956 until April 1960, we moved to Birmingham. We lived at 48 Rotherfield Ave. I remember Mrs. Marsh, Miss Turell? Stephen Bourne across the road was my best friend (same time at Carden). I have lived in Norway since 1972. I went to Carden from about 1963-1969. Lived at Midhurst Rise. I have no good memories of this school; like someone further up the page, I was bullied by pupils and teachers alike. The fallout from that has lasted me all my life. Some of the teachers did not have the temperament to be in that job, and if I remember correctly, in those days no training was needed to be a teacher, which accounts for a lot. The violence from some of the teachers would amount to assault these days, and be totally unacceptable. The reason for this posting however, was that I do have pleasant memories of Marilyn Crossman (now van Buren). I remember her lovely golden curls. We had a shared passion for Dr Kildare! I’m so sorry you had such a bad time at Carden, Amanda. My own memories are treasured, and I had lovely teachers. I was there from 1960 to 1967. When were you there? Our family lived in Midhurst Rise from April 1954, and my younger brothers Dennis, Richard and Patrick attended the school in the late fifties to the sixties. William McWhirter, see 13- 02 -15, courted my sister Mary for some years in the late fifties, during that time she was crowned Miss Hollingbury, sadly William died recently. Most of my family have fond memories of the Hollingbury Youth Club which was held in the school two nights a week, it was run by Mr and Mrs Harbour, wonderful nights. I was at Carden with your brother Patrick, Robert. I was Janet Hammond then. It was interesting reading the comments regarding Carden, I attended the school from1954/8, my brother Andrew from 1955. We lived in Cuckmere Way and then Denton Drive, fond memories of Hollingbury, playing in the street or walking the golf course, Stanmer woods and Giants Foot.Went on to Patcham secondary school,Mr Mann, White, Stone, Budliegh, Cresswell,Tyler and Bosanquot ? who helped promote playing rugby. ‘Rose coloured glasses’,a great place to live. I went to Carden infants and junior from around ’63 to ’71. Happy days. Freddie Allum, Steve Parsons, Charlie Carter, Ricky Ball, Bennie Kent, Jennie Lavender, Susan Hamlin – so many memories. Lived in Rotherfield Crescent. Still live in Brighton now, couldn’t leave.. I too went to Carden from 63 to 69, in the same class as Nicola Cager above. Hi Nick. Are you related to Pauline Gillard who was in my class at Carden? I’m sure I remember you as I lived around the corner in Hurst Hill. And are you now a stunt artist (and a very good one)? That is the same for me, John. I wish I could have studied under Mr Kitchen for all classes. I too remember the brothers Alan and Brian Clarke. Also Robert Clark. Whether he was related or not I don’t know. Nor do I recall which ones had an ‘e’ at the end of Clark. Derek Pomeroy and Chris Worrall, yes, also in the back of my mind. Including many others. Just wondering if you have any old photos of that era to post on this site. Hi, I have just found this site on which my brother Stephen Raynsford sometimes posts. I went to Carden School from 1953 until 1959 and then to Dorothy Stringer from 1959 until 1964. Does anyone remember the film shows that used to take place I believe on Monday evenings in the hall at Carden School? After the film show we used to visit the fish and chip shop in the shopping parade (which is now a Chinese take away)! Nice to hear from you Sandra Baldwin, for some reason never forgot your name, You must have made an impression on me hehe. I’m always fascinated how lives evolved, where everyone ended up. Its amazing with all the travelling I have done I have never met any old school friends around the world. I’m planning a trip back to the UK next August, I was hoping a reunion could be planned? Still talk with Phil Keating once a year. On facebook if you get on there. My email address is johnrlegg@gmail.com if you get the chance. Phil is not doing so good hence the trip back plus got invited to a reunion of Sussex Police 50 yrs in Lewes. I did get in contact with Gordon Pomeroy a few years back and he informed me his younger brother Derek (Pos) who was my age, passed away from cancer a few years back. I’m still in touch with Dave Clark and Phil Keating on a regular basis. Have talked with the Ross family – mostly the grandkids as Mick and his siblings appear to be technology challenged. Just a follow on from John Legg’s last post. By coincidence I have just bumped into Steve Ross who is the younger brother of Mick Ross and I lived near to them in Fernhurst Crescent. Mick now lives in France. I did point out to Steve that I still have the scar on my face which was caused by a very accurate shot by Mick using an improvised javelin, in reality a piece of old metal tubing! Mick Ross and myself made a banger gun out of a piece of tubing, one end bent for a handle. I lit a banger and dropped it in the tube, Mick followed with a ball bearing. He then aimed it at his house on Fernhurst Cres as we were standing close to Carden Hill. A large bang and the missile shot across the street straight through a window in Mick’s house across the street, penetrating the ceiling. Strange but true. One of the many escapades Mick and I got up to in our younger years. Funny you should mention javelin, Barry. Both Mick and iIwere javelin throwers at school. My distance came from having long arms, Mick’s was his muscle strength which contributed to him breaking many of his dad’s tools. I went on to be the long arm of the law (pun).